Mastering™ A&P is an online homework, tutorial, and assessment program designed to engage students and improve results. Instructors ensure that students arrive ready to learn by assigning educationally effective content before class, and encourage critical thinking and retention with in-class resources such as Learning Catalytics™. Students can further master concepts after class through assignments that provide hints and answer-specific feedback. With a wide range of activities available, students can actively learn, understand, and retain even the most difficult concepts. New vocabulary-building activities and Interactive Physiology 2.0 tutorials expand the options for students to use Mastering A&P as an effective practice and learning tool. Note: You are purchasing a standalone product. Students, if interested in purchasing this title with Mastering A&P or as a Pearson eText, ask your instructor for the correct package ISBN and Course ID. Instructors, contact your Pearson representative for more information. 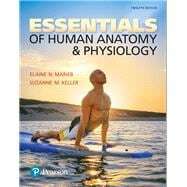 Mastering A&P and Pearson eText should only be purchased when required by an instructor. Elaine Marieb After receiving her Ph.D. in zoology from the University of Massachusetts at Amherst, Elaine N. Marieb joined the faculty of the Biological Science Division of Holyoke Community College. While teaching at Holyoke Community College, where many of her students were pursuing nursing degrees, she developed a desire to better understand the relationship between the scientific study of the human body and the clinical aspects of the nursing practice. To that end, while continuing to teach full time, Dr. Marieb pursued her nursing education, which culminated in a Master of Science degree with a clinical specialization in gerontology from the University of Massachusetts. It is this experience that has informed the development of the unique perspective and accessibility for which her publications are known. Suzanne Keller Suzanne M. Keller began her teaching career while she was still in graduate school at the University of Texas Health Science Center in San Antonio, Texas. Inspired by her lifelong passion for learning, Dr. Keller quickly adopted a teaching style focused on translating challenging concepts into easily understood parts using analogies and stories from her own experiences. An Iowa native, Dr. Keller uses her expertise to teach microbiology and anatomy and physiology at Indian Hills Community College, where most of her students are studying nursing or other health science programs.